Optimizes walker performance and stability; attaches quickly to walker leg; no tools required; long lasting nylon material. NOVA Walkers Skis are a must for any folding walker. They attach easily on the rear legs to allow the walker to smoothly glide over surfaces door jams and other terrains. The durable plastic skis last much longer than tennis balls and other glide options. 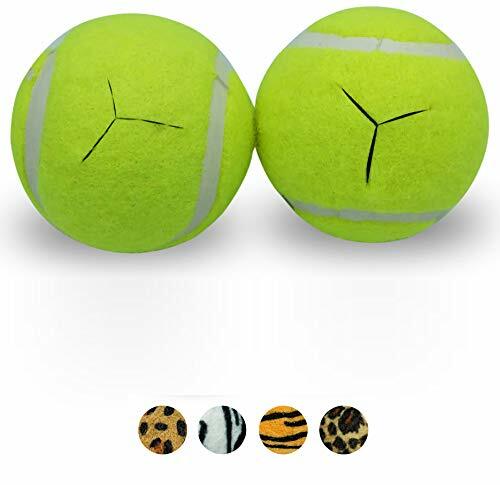 Unlike tennis balls they also do not track or collect dirt and germs from the ground. 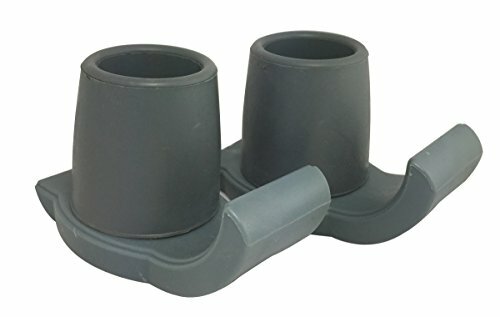 The attached rubber tip simply attaches to the tube of the walker leg no tools required. Fits all 1 inch tube shaft walkers. NO MORE TENNIS BALLS! Get Walker Skis! The ideal folding walker glide option for indoor and outdoor surfaces. Safe for wood floors and easy to clean. UNIVERSAL FIT for all folding walker makes and models with 1 1/8 tube shaft diameter. DURABLE & LONG-LASTING Walker Glide Skis are made of a special engineered Thermoplastic Polyoxymethylene (POM) - designed for strength, durability and maximum stability. 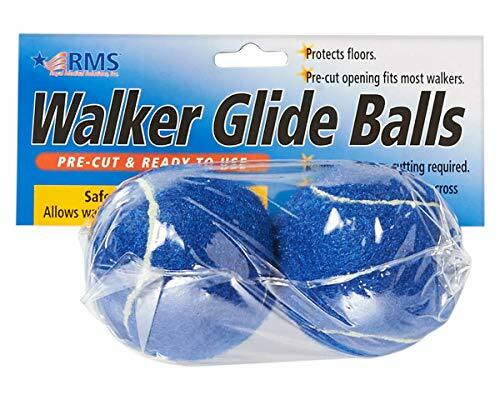 Royal Medical Solutions presents Walker Glide Balls that allow walkers to glide easily over floors. Recommended for in-door use. They are more durable and safer than tennis balls. Pre-cut and ready to use. The pop and glide walker ski pops on for easier mobility. 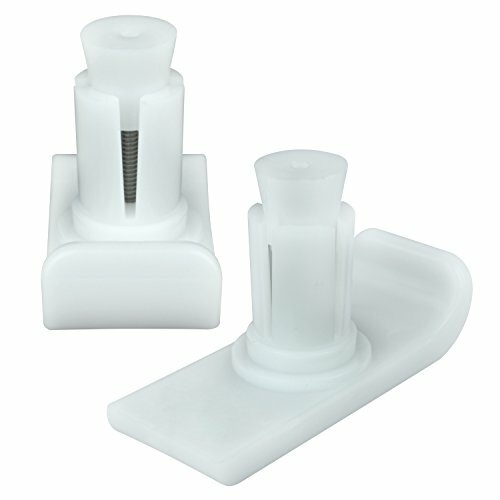 Simply remove your existing tips and add the ski on to allow you to glide over carpet, tile or concrete. The skis will fit on the back legs of any standard 1 inch walker and are designed to last. Each package comes with 1 pair of skis. Designed to be used on the rear legs of Folding Walkers only, neither intended to be used on the front legs nor intended to be used on any other medical device or household item. To ensure proper fit take tip off of the rear bottom leg of the Walker and measure outer diameter of the bottom leg tubing. If the measurement is 1 1/8 then these tips should fit your walker, if measurement is smaller or bigger do not use on walker. For proper installation remove rear leg tubes and remove existing tips. Place skis on hard flat surface and start inserting tube on an angle before straightening while simultaneously pushing down. A83100 Features: For Use With: -Walker. Product Type: -Glide or tip. Dimensions: Overall Product Weight: -1 Pounds. WALKER GLIDES WITH AUTO-BRAKES: These make great walker accessories. Smoothly navigate carpet, floors, sidewalks and more with the convenience of walker glides & the added safety of auto-breaks. To activate push down on your walkers' handles and the auto glides activate the brakes for stability. 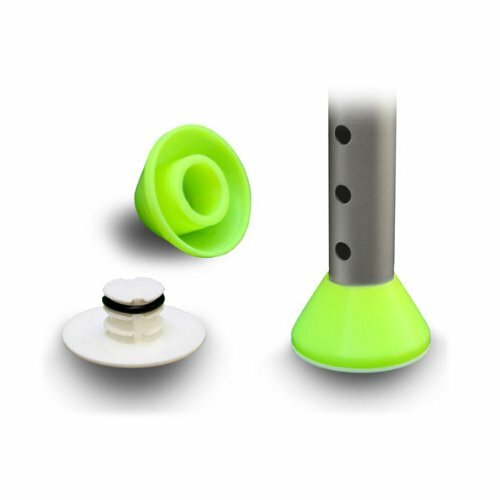 NO MORE WALKER TENNIS BALL GLIDES: Tired of unwieldy, ugly looking walker tennis balls on the feet of your walker? Carex Auto Glides provide a glide similar to walker skis, but with a smooth rolling motion. Fits 1-Inch walkers. DURABLE: For indoor & outdoor use. NOTE: Always inspect the rollers for wear and tear. Replace as needed. COMPATIBILITY: These work with four (4) leg walkers, walkers with two (2) wheels or a walker with seat and wheels. EASE, SAFETY & COMFORT: Whether you are living with long-term mobility challenges, recovering from surgery, or addressing safety issues as you age, Carex creates home care products to help you achieve the ease, comfort, & safety you deserve in your home. Replace tennis balls, wheels, and rubber tips on your walker legs with walker coasters. 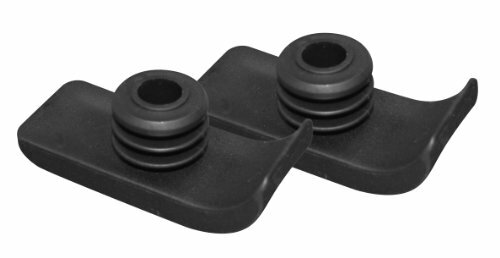 These useful replacement footpads smoothly glide over carpet, tile, wood floors, doorways, bumps, cracks, and sidewalks. They are made to be the longest-lasting replacement tips on the market. Walker coasters are a safer, cleaner alternative to the tennis balls many users place on walkers to help them see the walker's legs and avoid stumbling or tripping. Where the soft covers of tennis balls tend to grab, especially on rough surfaces such as concrete, walker coasters glide over surfaces. And where tennis balls absorb water and collect debris, walker coasters shed both water and excess debris. Walker coasters work better than skis because they slide in all directions and won't turn sideways, and they won't fall out like some walker skis. 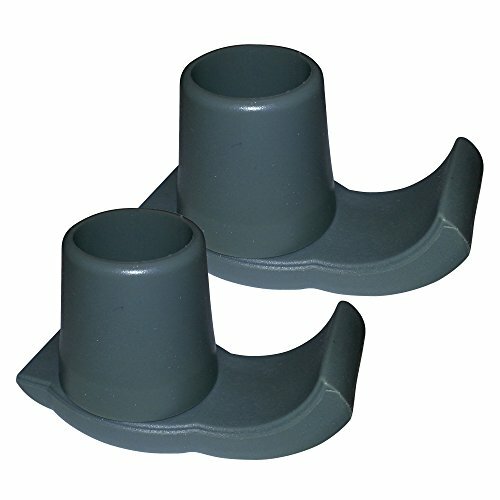 Walker coasters fit standard 1 inch walker tubing and install easily without tools. Walker coasters are "tennis ball yellow". Includes one pair of walker glides. Made in USA. Safely maneuver over any surface with the Vive walker ski glides. Compatible with all walkers, the glides reduce noise and provide additional stability when navigating rough or uneven surfaces. The scratch-resistant ski glides are durable for extensive use, indoors or out. This set also includes two velour covers for added protections against snags and scratches. Allowing for smooth, easy mobility, the Vive walker ski glides are universally sized to easily attach to all walker styles. The curved ski glides securely slide into place, with a post diameter of 1". Navigate over carpet, tile, pavement or concrete without dragging your walker or using unsightly tennis balls. This set of two walker ski glides also includes two velour glide covers for indoor use. Constructed with a strong composite material, the thick walker ski glides are durable for extensive use. The smooth glides reduce noise and will not scratch hard surfaces or snag carpets or rugs. Safely maneuver indoors and out with the smooth walker ski glides. Great for concrete sidewalks, pavement and blacktop, the scratch-resistant walker glides provide additional stability on any surface. 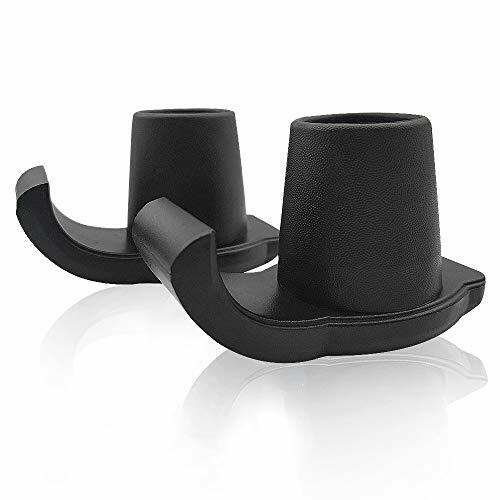 The inclined ski tips easily glide over door jams, rugs and from tile to carpet. Two velour covers are included for indoor use. These covers provide additional protection against snags and scratches when moving from outdoors to indoors. COMPATIBLE WITH ALL WALKERS: Allowing for smooth, easy mobility, the Vive walker ski glides are universally sized to easily attach to all walker styles. The curved ski glides securely slide into place, with a post diameter between 1" - 1 1/8" . Navigate over carpet, tile, pavement or concrete without dragging your walker or using unsightly tennis balls. This set of two walker ski glides also includes two velour glide covers for indoor use. SUITABLE FOR INDOOR/OUTDOOR USE: Safely maneuver indoors and out with the smooth walker ski glides. Great for concrete sidewalks, pavement and blacktop, the scratch-resistant walker glides provide additional stability on any surface. CURVED TIPS WITH VELOUR COVERS: The inclined ski tips easily glide over door jams, rugs and from tile to carpet. Two velour glide covers are included for indoor use. These covers provide additional protection against snags and scratches when moving from outdoors to indoors. DURABLE COMPOSITE GLIDES: Constructed with a strong composite material, the thick walker ski glides are durable for extensive use. The smooth glides reduce noise and will not scratch hard surfaces or snag carpets or rugs. 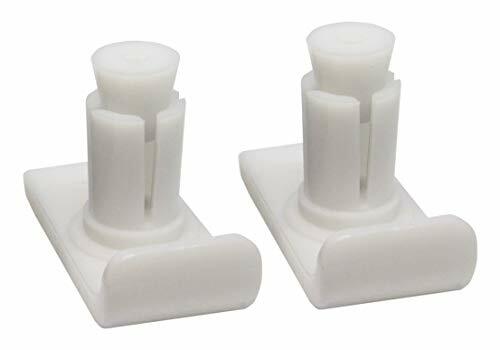 The Stander Replacement Ski Glides are made of a thick wear resistant plastic that will allow you to roll smoothly over any surface. 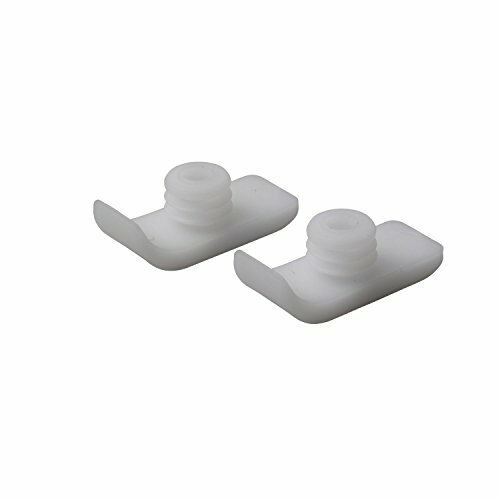 These replacement glides work with the Stander EZ Fold N' Go Walker and the Able Life Space Saver Walker. To replace your current glides, loosen the old screws that are found towards the feet of your walker. Pull the old glides out, and replace with your new glides. Tighten the screws with your included wrench. Get a deal on TWO PAIRS of these durable walker ski glides are specially designed by Top Glides to fit Drive Medical walkers. Featuring rugged nylon plastic construction that will last. Plus a great low price to save you money! Guaranteed to fit Drive Medical 1" standard walkers or your money back. Also compatible with most walkers from other manufacturers. Use with Top Glides GlideSocks to help protect floors from scratches. *Easily slides onto most of the walker's rear legs. Color:black The pop and glide walker ski pops on for easier mobility. 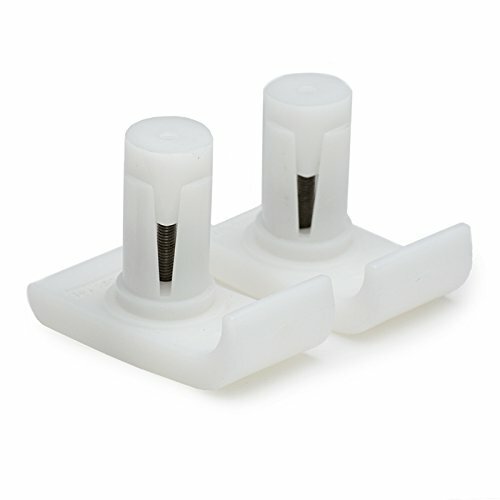 Simply remove your existing tips and add the ski on to allow you to glide over carpet, tile or concrete. The skis will fit on the back legs of any standard 1 1/8" walker and are designed to last. Each package comes with 2 pounds. 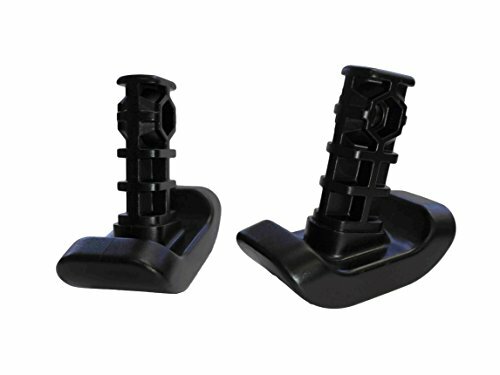 One of our most popular products because a flexible attachment mechanism means these ski glides will fit most walkers. Thick nylon plastic skis make these a durable and versatile choice for many surfaces. Exclusive "clipped ski" design for easier navigation. Simple to install with a screwdriver. Coupon for discount on your next Top Glides purchase. Order 4 or more pairs for free upgrade to expedited shipping. Available in gray, black, and white. Here at Star Top, we develop walker accessories to improve everyday life, and make the lives of our customers less problematic. These walker balls are no exception. WHAT MAKES STAR TOP BETTER?  Ready to Use - Precut for your convenience, why Risk injury or waste time cutting old balls!  Extra-durable felt. Don't Settle for fast wearing walker balls! Guaranteed to last as long as Regulation Tennis Balls, because they are!  MOST ANY BRAND Walker, including Drive Medical Walker, Vive, Nova, Medline, Invacare, and many, many more! 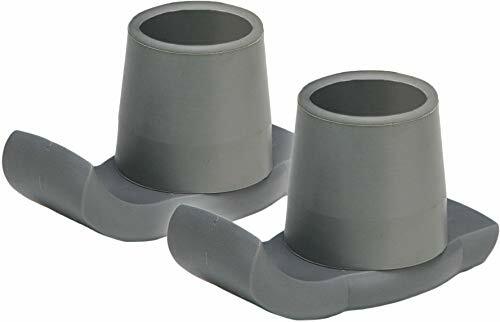 ANY INDOOR SURFACE (not best used outdoor long term on concrete, rough metal, rugged terrain Life with a walker is hard enough, why complicate it with tube grabbing walker ski's or expensive replacement pads or caps? Time proven, inexpensive tennis balls are the answer to get you rolling back into action. What are you waiting for? Order your Deluxe Star Top Walker Balls today! IMPROVES WALKER GLIDE MOBILITY for any senior or movement-challenged person over time. Startop Walker Balls use real tennis balls with premium grade felt, which glides optimally over doorways, sidewalks and carpets where other coasters get stuck. PRE-CUT STAR TOP OPENING for and UNIQUELY SECURE FIT - why risk injury or waste time cutting old balls. Our specially engineered cut pattern allows for much a better fit then any other walker balls on the market. 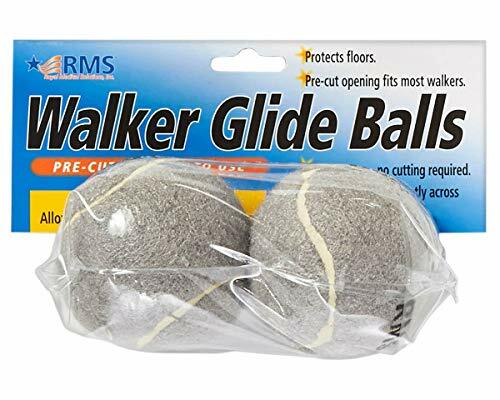 PROTECT YOUR FLOORS FROM SCRATCHES - Unlike plastic walker glides, our custom cut walker balls set of 2 will never cause scuff marks, nor nick or scratch your precious hardwood, linoleum, or Pergo floors. Glide easily across most surfaces. SUPER EASY TOOL-FREE INSTALLATION - Easily slides onto 1 1/8 tubing of most walkers easier with no additional tools necessary. And, we use actual tennis balls, not cheap toys, allowing for maximum durability, to sustain long term use. Best Value Walker Padded Hand Grip Covers by Crutcheze The ORIGINAL Contoured Walker Pad MADE IN USA Are you or a loved one using a walker or crutches? Hands need relief? Get Crutcheze Doctor Recommended and Most TRUSTED Brand for Your Ultimate Comfort! Designed by healthcare professionals with YOU in mind to be exceptionally comfortable, fashionable and affordable. Crutcheze Features Set contains 2 slip resistant hand grip covers with ultra comfy contoured removable padding for superior support BODYCARE Antibacterial, moisture wicking, breathable, quick drying covers keep skin dry and comfortable plus UV-Ray protection slows color fading Easy installation - Stretch covers over standard walker or rollator hand grips, attach hook and loop for instant fit Washable, Latex free, One size fits all standard walkers and rollators, Walker NOT included 100% Satisfaction Guarantee BUY WITH CONFIDENCE! Crutcheze provides a 100% Satisfaction Guarantee. If you are not satisfied with your purchase you can return it for a full refund or replacement. Customer Care Need help? Contact us if you need extra padding, softer padding, thinner padding or assistance outfitting your walker. For over a decade, doctors, physical therapists, pharmacists and nurses have recommended and sold Crutcheze products to their patients. And, now, for your convenience, Crutcheze walker pads are available at a best value price on Amazon! Are you ready to heal in style and comfort? Click Add to Cart to get your Crutcheze fix NOW! 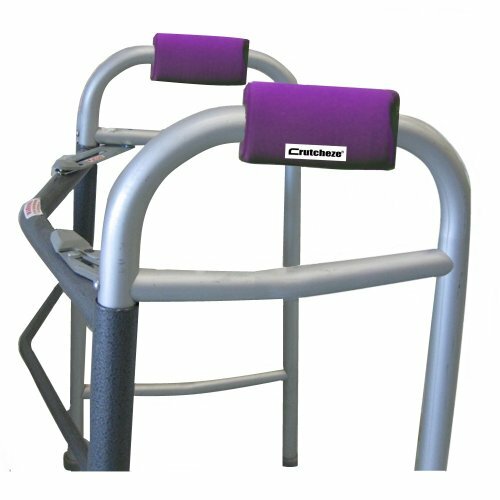 #1 SELLING BRAND - Crutcheze Walker Pads provide ultimate comfort, style, protection and easy care. The ORIGINAL Contoured Walker Hand Pad - Slip resistant with highly engineered premium medical foam core padding provides superior support, extra comfort and is latex free. EASY TO APPLY - Stretch covers over walker hand grips, attach Velcro for instant fit. MADE IN USA -100% Satisfaction Guarantee! One size fits all standard walkers and rollators. Machine washable. Walker NOT included. Royal Medical Solutions presents Walker Glide Skis that were designed carefully by healthcare professionals. 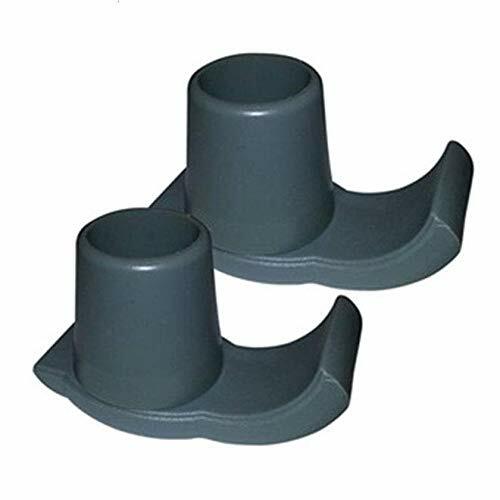 It is a Universal Replacement Feet for most folding walkers. It is to be used on rear legs of walkers with 1" to 1 1/8" tubing diameter. The coaster skis are made of heavy duty material for safety and stability. It is recommended to use outdoors only. Glide smoothly on concrete pavement and sidewalks. Easy to install. 100% Satisfaction Guarantee. A set of 2 Glides. UNIVERSAL FIT FOR WALKERS: Use on rear legs of most walkers with 1 to 1 1/8 tubing diameter. OUTDOOR USE: The walker ski glides are made of durable material for long lasting use. It moves smoothly and safely over concrete pavement and sidewalks. EASY INSTALLATION: Use a standard Phillips screwdriver to lock the ski glide into place. 100% Satisfaction Guarantee.